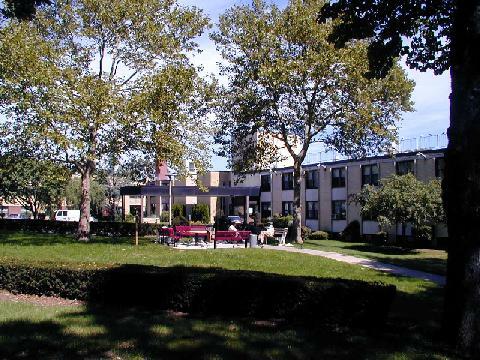 Our 213 bed skilled nursing facility is nestled on 7 1/2 acres of beautifully landscaped grounds in the northeast section of the bronx. Here we provide a homelike atmosphere with comfort and compassion for our residents. We are even conviently located to all major highways and are accessible by car, subway and bus. The United Odd Fellow & Rebekah Home provides many wonderful programs including New Horizons, a "Buffet Style" food service delivery system, Senior Reach Out And Read (Sr. R.O.A.R. ), art therapy and music therapy, and a spectacular intergenerational volunteer program including over 200 children weekly providing service for out residents. While our home continues to receive accolades for all of its efforts to deliver a high quality of life to our residents, the challenges of operating a first class nursing facility such as ours remain many. The ongoing task of keeping the physical plant functioning in optimal conditions while delivering the skilled care and services present a never ending challenge each day of the year. Although no Crystal ball is available, one thing that is certain is that the future is changing with each passing day and moving with cyber world speed. Whether we like it or not, the challenges will continue to increase and will cast upon us with the need to react with an even greater wisdom and faster response times. Keeping up with new technology in geriatric medicine and new modalities of treatment of care, the need to continuously train and upgrade professional staffing, adhering to ever-changing government standards and regulations, managing costs and remaining viable in a highly demanding market place are just some of the opportunities that lie ahead. As we reflect upon the many challenges that loom ahead in our focus on building for the future, our new campus, we are confident that our wonderful and talented Board of Directors in coordination with out professionally gifted staff will not only meet, but exceed, all of our future needs. Remeber "You ain't seen nothing yet..."
Lombardi We are proud to announce that soon we will be starting a new service. A long term home health care program has been added to our facility. The Lombardi program will allow us to come out to people's home and care for them instead of them coming to us. It is a true nursing home without walls program. Our New Building The new building is coming along, the outside walls have been put up and the insides are going up nicely. We plan to move in all the residents to the new building by May of 2007. Senior R.O.A.R.Senior R.O.A.R. (Reach Out And Read) is our unique, award-winning program, that features 5th grade students reading to our residents for 1 1/2 hours per week. Currently, there are 75, 5th grade students from P.S. 36 and 75, 5th grade students from Holy Family School participating. May 13th United Odd Fellow & Rebekah Home Day We were honored to receive proclamations from both the Mayor's office and the Bronx Borough President's Office proclaming May 13th from this point forth, United Odd Fellow & Rebekah Home day. New Horizon Step into our new program for those who have been diagnosed with Alzheimer's/Dementia. The staff of United Odd Fellow take pride in our devoted philosophy of enrichment, enhancement and caring for those who no longer have the capability that they once so rightfully called their own. Buffet System Our facility has a unique dinning experience which the resident is allowed to chose their portions and what they want to eat. A buffet style system that allows the residents to order their food from it but also smell it before they even sit down.